Meet Rana Sobhany. She puts together some great beats using only two iPads and some apps. 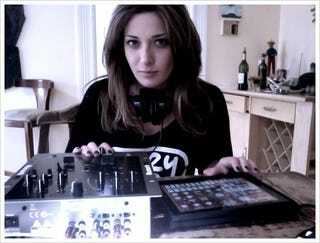 No laptop or synth needed—this gal's an iPad DJ. As she explains in Rob Scoble's (extra-long) video, Rana is using some additional equipment for this presentation, but she can work with just her iPads and some apps—Groovemaker House, Looptastic HD, iDaft, AC-7 Pro, Pianist Pro, and Sonosaurus Rex to be specific.